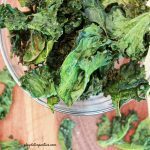 This crispy kale chips recipe is so easy a 5-year-old can make it...no really! Take a look at how we're encouraging healthy cooking with kids by a trip to the market and this tasty recipe. Remove the tough ribs from the kale leaves and tear the leaves into pieces, approximately the size of the palm of your child's hand. Place torn leaves in a large bowl. When all the leaves are in the bowl, add olive oil 1/2 tablespoon at a time, gently tossing to ensure that the leaves are fully covered, but not too damp. Sprinkle generously with sea salt and gently toss again. Spread kale leaves in a single layer on a baking sheet and bake for 15 to 20 minutes, turning leaves over after 10 minutes. When chips are crispy, remove from oven and let cool before eating. Make sure the leaves are completely dry. Kids love to use salad spinners, though I prefer gently pressing the leaves between sheets of paper towels. This is one of the few recipes where I don't recommend lining your baking sheet with parchment or foil. Using a liner will trap any excess moisture between the leaves, resulting in a hot pile of mush instead of crispy kale chips. A single head of kale will probably take 3 or 4 baking sheets/rotations in the oven. Don't be tempted to pile the leaves high in order to save time. Crowding the leaves will just cause them to steam, and they won't get crispy. Make sure you use a good quality salt on your kale chips. We used pink Himalayan sea salt, but ground Kosher salt would work well too.